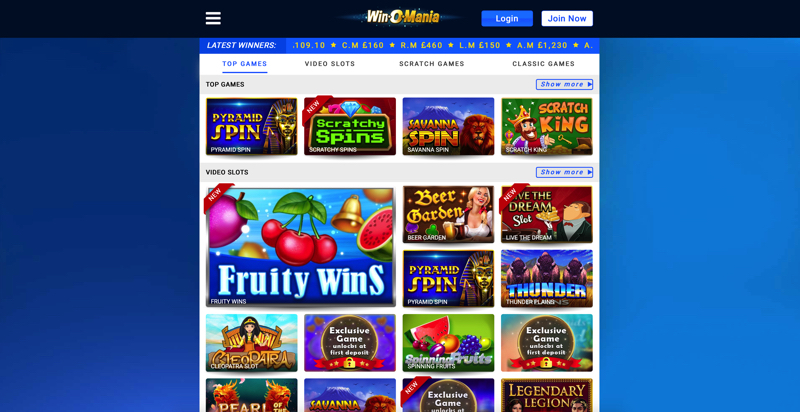 Winomania is a new online casino, which was launched in 2018. It focuses on video slots and scratch card games. All games are developed inhouse, so you won’t find them anywhere else. The casino supports both desktop and mobile play. Winomania is licensed and regulated by the UK Gambling Commission. Winomania is powered by proprietary software. They also offer a VIP program. Winomania currently only support debit- and credit cards. The withdrawal limit is £3,000 per month, but higher limits are available for VIP players. The casino is in English and the standard currency is GBP. The helpdesk is available by chat and email (not 24/7 though). Only residents from the UK are allowed to play at the casino. “Are you looking to play at an exciting online casino bursting with amazing games, promotions and the chance to win big cash prizes? Then look no further than the exciting Winomania!